One of the features that webi was lacking for years was the ability to conditionally suppress columns. Especially when compared to Crystal that supported this kind of functionality from the get go, or Xcelsius with its dynamic visibility, webi report designers needing to show or hide columns in tables based on certain conditions were left to use cheesy tricks like setting the column width to 4px (historically, the minimum column width in webi) with white font and white background alert rules. This technique worked “O K” online, but exporting reports to excel revealed the “hidden” data columns and the extra padding could cause some formatting issues. Well, webi in BO 4.0 has made a big step forward to resolve this issue. Now, any report element can be conditionally set to hide based on a formula, allowing report developers to create different tables for different scenarios. Your reporting requirement is to present e-Fashion stores revenues by State and City, prompting users for a reporting Year. Moreover, in 2004, there were less stores and management wants to break down sales by stores, but only in 2004. 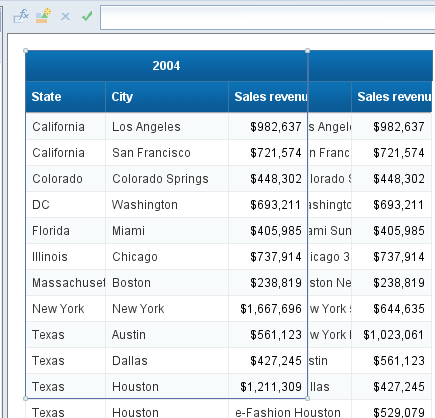 You can start by setting up your query with the needed objects: State, City, Store Name, Sales Revenue and Year. You can make Year a prompt. Now, you can create two blocks in webi: one with the store name, and one without. Next, use good old relative positioning to align them along the top right corner of each other. Finally, go to each report block format options, and specify the appropriate formula to determine when to display or hide it. And Voila! When users select 2004 as the prompt value, they will get the store names column, for other years it will disappear. This entry was posted in Web Intelligence and tagged Dynamic Visibility in Webi, Hide Column in Webi, Web Intelligence Conditional Hide. Bookmark the permalink. Hmm … you can already do this in Web Intelligence 3.1 by applying a block level filter. However in WEBI 3.1 it’s much more cumbersome to emulate dynamic visibility vs WEBI 4. Thanks a lot for ur example. Its really cool. Thanks for the example to help us visualize this workaround. 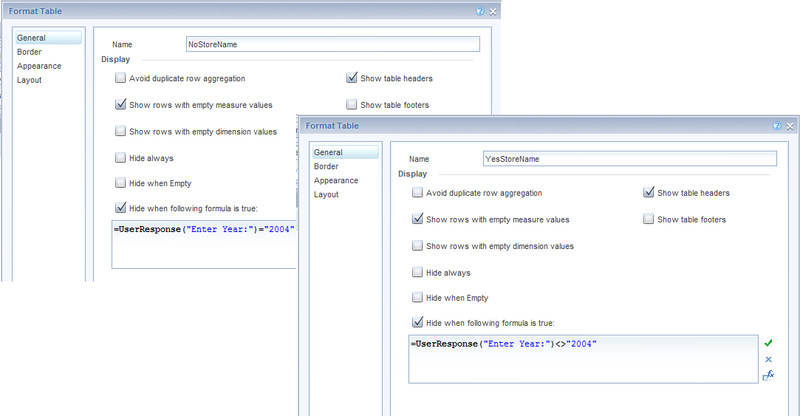 From your Example it is pretty straight-forward to hide/show tables based on 1 or 2 additional possible scenarios. But is there a better/more efficient way if the situation involves a lot more possibilities? My situation currently involves displaying potentially 20-30 more independent columns driven by what different flags on DB. Depending on the flag, users would want to see column A,B,C,D.. or A,C,D.. or A,F,G..
Based on such a requirement, i would suggest looking at using Crystal. Using conditional suppression on fields or sections in Crystal might be a better way to go when dealing with such a dynamic layout requirement in a report. I have a business requirement that is probably best addressed by hiding whole reports (in a muli-report Webi document). is there any capability to apply this at an individual report level? Hi Rob, there is no way to hide a report tab in webi without programming. You can hide all the blocks in the report tab, but not the actual tab. For highly flexible layout requirement, i would look to leverage crystal where you can truely have complete control over as many reports sections as you like through conditional suppression. This is Really a Very Good Post. Very Helpful.Thank You so much for sharing . regret while pasting the example data, data got pasted twice. This article is quite misleading. All you are doing is hiding one table (block) or another depending on formula set for those blocks. Webi still lacks the ability to dynamically hide columns even in 4.1 SP6. I have 15 rows /columns and i want to hide 2 columns ,so one user could see all when he filters on input control and the next user could see 13 when he filters in input control.i followed the same steps as you have above but am unable to to hide my columns.Does it mean that i have lots of rows and columns?Also am not really sure what to set in align relative position for vertical if i select start on a new page or repeat on a new page i loose my second block which one should i set it to? and when i try to lay each page on top of each it stii wont lay on top of it. could you think of what am doing wrong? Hi , I have a webi report that contains columns for years 2016,2017,2018 etc. and under each columns contain calculated figures that are using webi PREVIOUS() function. For e.g. 2018 calculated figure needs 2017 and 2016 figures as well, 2017 calculated figure needs 2016 figure. When I pun it in a table, it shows 2016, 2017, 2018 columns. But I just want to show to my user the current year which is 2018. I cannot use filter table (YEAR=2018) since the 2018 figure will be wrong since it needs the 2017 & 2016 figures to be calculated in. How can I generate a table that only shows 2018 figure without compromising 2017 & 2016 figures? Is there a way around it?